What are the warning signals and how bright is the future? Australia, UK and Germany are now becoming extremely mature markets in the CFD & Forex space, with a few of the largest brokering firms enjoying a stranglehold on the majority of retail traders. Given how mature the market is, it is becoming harder for the small, up and coming CFD or FX firms to enjoy the success of their much larger counterparts. Today I’m going to take a look at the future of the Forex & CFD companies, given the warning signals showing up and how companies might be able to better position themselves for the change in direction. From 2014 to 2015, the Australian CFD industry grew a meagre 2%, from 42,000 traders to 43,000. In contrast, during the boom period, the CFD market was growing at a staggering 100% per annum, but then the GFC put a dampener on that. Back in the heydey, securing a new client who deposited funds and placed a trade was as low as $100 – $150. Then costs began to escalate over the years until $600-$700 was considered the norm. Nowadays, it is not uncommon for most companies to be paying more than $1,000 – $2,000 per live trading account. 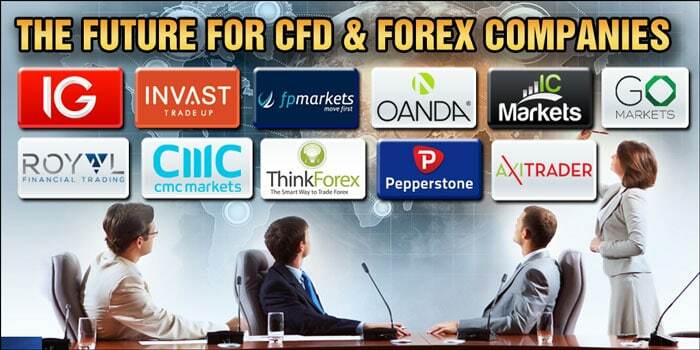 The CFD & Forex industry is an expensive business due to the escalation of global competition, in this very lucrative field. Another red flag is the lucrative Introducing Broker (IB) and affiliate space. Many years ago the smart broker’s formed alliances and partnerships with the top educators in the key countries, ran endorsed email campaigns and joint seminars and secured a substantial revenue stream for the new partner. It was a golden period. Unfortunately, there has been a track record of some of the biggest CFD & FX brokers cutting their affiliates off and taking over the very nice income stream from the partners’ clients, leaving a sour taste in the affiliates mouth. You may have noticed how razor thin Forex spreads are getting, with many brokers now offering zero spreads across a wide range of currency pairs. Granted, you normally have to pay a nominal brokerage fee to access these fleeting zero pip spreads, but still, they are there. I have seen them. With spreads and brokerage rates falling faster than the Swiss Franc on January 15, where is the money coming from to pay IBs and earn commissions? Leaprate recently announced the publicly listed Playtech unit issued layoffs to over a hundred staff. Of those remaining, many were taken off commission based payments and offered a straight salary. The reality of the situation is that it is becoming more expensive to secure live trading accounts. Even more so now the industry is more mature. Having said that, when the boom times return, watch this space. Every man and his dog will want a new CFD or FX trading account. Binary options brokers have started to pop up everywhere. Even some of the big players introducing them as part of their offering. Here are a few of the top binary options brokers in Australia. Binary Options brokers are renowned for giving highly incentivised deposit bonus opportunities. Unfortunately, many of the offshore Binary options sales people among the most persistent in the industry. Many family members and friends continue to tell me how often these offshore binary options brokers call them to get them to open an account with cash bonuses. Veteran traders aren’t interested in the Binary Option concept. However, many newbies seem to gravitate towards them. The reason for that is the simplicity of the product. If you have a spare 5, 10, 30 or 60 minutes, you can allocate a small portion of money to the trade. You are having a punt on the direction after the set time frame. Being able to trade on a lower time frame is the real appeal of Binary Options. I often think of a group of traders sitting around a lunch room with the binary options platform on their mobile device having a bit of fun between them, going for quick 5-10 min Forex bets to see who can turn $5 into something bigger. The very nature of Binary Options means you are taking a punt on the direction of an instrument. You are looking at predicting if it will be higher or lower after a set time frame. Local regulators, such as ASIC and the FCA, have done an excellent job in ensuring CFD, Forex and Binary Options Companies are not able to promise the world or suggest they are a potential path to riches. So many brokers have jumped into the lucrative Binaries space. This includes the big players. But before long, they are going to run into the same situation as the CFD & Forex space. The amount of new ‘blood’ required to keep the dollars ticking over, means the marketing budget has to continue to get bigger and bigger to net the same result. One of the positives of all this is the retail market has continued to become more informed and are now starting to ask more qualifying questions of their brokers. Finally, we are starting to see the less scrupulous CFD & FX brokers going by the wayside, while the more established brokers, offering a secure price feed and doing the right thing by their clients, continue to gather more and more market share. How strong are your price feeds? What Prime of Prime brokers are you using? Do you have a direct relationship with a Prime Broker (PB)? Where do you aggregate your prices from? What FX brokerage rate can you offer if I’m turning over X yards per month? How is your back office reporting? What incentives or rebates do you have for doing X volume per month? Can I get access to your top analysts? As you can see, the conversation has moved away from deposit bonuses or free mobile phones (got a few of these back in the day) to the actual things that help you become a more consistently profitable trader. So what is the future for Forex & CFD brokers around the globe? Client retention, sophisticated data analytics and access to quant trading strategies seem to be popping up more and more. If you already have significant market share, brokerage rates and spreads continue to get more competitive, the cost to acquire a new client continues to rise, and sales staff are getting edgier, then the key focus has to be client retention. In every market, there is a golden period. The time when you mix new technology with existing markets. The new players don’t just get excited, but they create a mini-revolution to get on board the rising tidal wave. For the CFD and Forex space, it was 2004 – 2007. Then again from 2012 – 2015, albeit the later years were not nearly as exciting as the first period. In reality, the big CFD & Forex brokers have secured a pretty substantial market share, and they aren’t likely to lose control any time soon. Instead, their focus is on providing the best tools, customer service and education they can to keep their clients satisfied. They will do this through a mix of content marketing, online video (getting bigger and bigger) and partnering with recommendation services which are good at what they do. Here at Profile Booster, we have been in touch with a new startup company who will be launching mid-2018. They will provide portfolio management tools which are the most advanced we have ever seen. This innovative company has decided to bring institutional style portfolio management tools to the retail trader. To be honest, I’ve never been so excited about a product launch as I have sat with this man. Hearing his vision and the technology underpinning his new service. We promise to let the cat out of the bag in due course. We’ll update this post when it happens. There is no mistake in the rise and rise of the new breed of Fintech companies. Some of the most innovative technologies and services are hitting the market with astonishing regularity. One angle some CFD & FX companies are taking is to offer ETFs in with their current range of trading instruments. This allows the less aggressive trader to access ETFs with leverage and diversify their portfolio with the one instrument. We saw last year that IG had partnered with Blackrock to offer ETFs as part of their overall suite of trading instruments. One of the biggest entries into the investing world over the last few years is thematic and managed investing, allowing investors to build a managed, well-diversified portfolio and in many cases, significantly reduce their management fees. To be honest, it is hard to keep up with the new robo advisor style companies popping up; there are just that many of them. The good news for you and I as investors is that the more competition, the lower our costs of doing business. These companies are focused on the growing Self Managed Super Fund (SMSF) space. As you can appreciate, there is a lot of money in the SMSF sector. There are many articles written about the Robo Advice companies such as here, here and here. One of the first companies to access the thematic portfolio management services in Australia using leverage was Invast. Their PortfolioInvestor product allows traders and investors to identify their preferred market themes (such as cyber security, driver-less cars and biotechnology and robotics to name a few), and have their portfolio professional managed and rebalanced throughout the year as market conditions change. The next wave of technological advancements and innovative product offerings are starting to become more common place among the retail investment public. Not only that but CFD & Forex providers are starting to add these tools to their current platform providing more resources for the savvy investor to take advantage of. So whether you are an established broker, a new broker looking to grow your book or an individual retail trader/investor, the future is looking extremely bright.